Joshua Tree National Park  is a United States National Park that is located in the Southern California Desert. The park encompasses nearly 800,000 acres of the Mojave and Colorado Deserts, conserving two separate desert ecosystems at different altitudes. The name of the park is derived from the distinctive Joshua Tree, a tall-growing variety of the yucca genus that grows prevalently within its boundaries. The area enclosed by the park was declared a National Monument in 1936, a Biosphere Reserve in 1984 and finally a National Park in 1994. The name Joshua Tree was reportedly given by a band of Mormons who crossed the Mojave Desert in the mid-19th century, the tree's unique shape reminding them of a Biblical story in which Joshua reaches his hands up to the sky. The profile of the Joshua Tree National Park (then a National Monument) was raised significantly in 1987 with the release of the best-selling U2 album The Joshua Tree, the cover of which featured evocative black-and-white photography of the Park's landscape and distinctive trees. 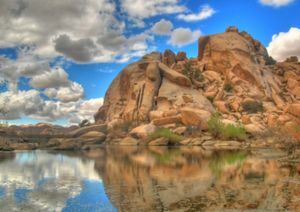 Two deserts, two large ecosystems whose characteristics are determined primarily by elevation, come together at Joshua Tree National Park. Below 3,000 feet, the Colorado Desert encompasses the eastern part of the park and features natural gardens of creosote bush, ocotillo, and cholla cactus. The higher, moister, and slightly cooler Mojave Desert is the special habitat of the Joshua tree. 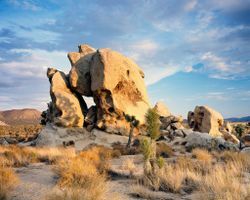 In addition to Joshua tree forests, the western part of the park also includes some of the most interesting geologic displays found in California’s deserts. Five fan palm oases also dot the park, indicating those few areas where water occurs naturally and wildlife abounds. While it may at first appear lifeless, the desert supports many plants and myriads of creatures which become active during the evening and early morning. 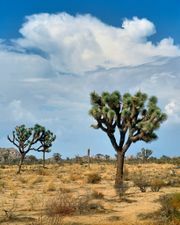 Joshua trees are the park's best-known plant, but oaks and junipers are also common, and in spring, wildflowers carpet the sand, and cacti bloom in vivid colors. Lizards, tarantulas, and rattlesnakes may be found among the rocks. Birds in the park include burrowing owls, vultures, golden eagles, and roadrunners. Coyotes are commonly seen near the park roads making their rounds. Jackrabbits and the shy kangaroo rats emerge from their dens in the evenings to forage. Bobcats are less frequently seen, but a lucky traveler might catch one silhouetted against the moonlight. Days are typically clear with less than 25 percent humidity. Nights are much cooler than days. Temperatures are most comfortable in the spring and fall, with an average high/low of 85 and 50°F (29 and 10°C) respectively. Winter brings cooler days, around 60°F (15°C), and freezing nights. It occasionally snows at higher elevations. Summers are hot, over 100°F (38°C) during the day and not cooling much below 75°F (24°C) until the early hours of the morning. Palm Springs International Airport (IATA: PSP)  and Ontario International Airport (IATA: ONT) are the closest airports to the park. Will need to rent a car to get out to the park as there are limited to no public transportation options to the park. Palm Springs is also the nearest city with an Amtrak station; it is served by the Sunset Limited  Los Angeles - New Orleans route. Joshua Tree National Park lies 140 miles east of Los Angeles. It can be approached from the west via Interstate 10 and Hwy 62 (Twentynine Palms Highway). The north entrances to the park are located at Joshua Tree Village and the city of Twentynine Palms. The south entrance at Cottonwood Spring, which lies 25 miles east of Indio, can be approached from the east or west, also via Interstate 10. Entry fee options are as follows: The Joshua Tree National Park Annual Pass, $40 for 12 months; vehicle entry, $30 for 7 days; walk-in/bike entry, $12 for 7 days. Alternatively, the new (as of January 1st, 2007) National Parks and Federal Recreational Lands Pass can be purchased for $80 and allows free entry to all National Park Service, U.S. Fish and Wildlife Service, Bureau of Land Management, Bureau of Reclamation, and U.S. Forest Service sites where entrance or standard amenity fees are charged for one year. The main roads through the park are paved and easily accessible to passenger vehicles. Several dirt roads through the park may also be passable by automobiles, although conditions often require high-clearance, four-wheel drive vehicles; check at the ranger stations for current road conditions. There are numerous trails throughout the park. They are not blazed but do have signposts occasionally and are easy to follow, although the sandy paths make for rugged hikes. Be sure to carry and drink lots of water while hiking. Backcountry hiking and camping are allowed, but you must bring your own water, as what little water there is in the park is reserved for wildlife. Many of the park trails and roads are excellent for mountain biking; check at a ranger station for options. Hidden Valley. Located in the northern portion of the park, a short trail leads through boulders to an old cattle rustler's hideout. Barker Dam. Built in the early 1900's to hold water for cattle and mining use, today the area is a rain-fed reservoir attracting local wildlife. Keys View. This overlook, with an elevation of 5,185 feet above sea level, is an extremely popular spot for watching the sunset. On rare clear days the view extends over the Salton Sea to Mexico. Geology Tour Road. Four-wheel drive vehicles are recommended (but not always necessary, check with rangers) for this eighteen mile dirt road. Along this route are numerous interesting geologic formations and trails. Cholla Cactus Garden. A short walk leads through a thick stand of cholla cactus, noted for its especially prickly exterior. Cottonwood Springs. Located near the south entrance of the park, Cottonwood Springs is a desert oasis that offers a respite from the arid lands around it. Willows and birds are found in abundance near this natural spring. Boy Scout Trail (16 miles / 25.8 km). A scenic trail through the edge of the Wonderland of Rocks that is moderately strenuous. 49 Palms Oasis Trail (3 miles / 4.8 km). A hike to an oasis surrounded by stands of fan palms and pools of water. Moderately strenuous. Lost Horse Mine/Mtn. Trail (4 miles / 6.4 km). Site of ten-stamp mill. The summit elevation is 5,278 feet (1,609m). Moderately strenuous. Lost Palms Oasis Trail (8 miles / 11.2 km) A canyon with numerous palm stands, with a possible sidetrip to Victory Palms and Munsen Canyon that involves scrambling. Moderately strenuous. Mastodon Peak Trail (3 miles / 4.8 km). A trail offering excellent views of the Eagle Mountains and Salton Sea, with a summit elevation of 3,371 feet (1,027m). Strenuous. Ryan Mountain Trail (3 miles / 4.8 km). Excellent views of Lost Horse, Queen, and Pleasant valleys with a summit elevation of 5,461 feet (1,664m). Strenuous. The odd shapes of the Joshua Tree, as well as the dramatic geology and desert scenery, make the park a great place for photographers. As with many areas, photography is best in the early morning and late evening hours. The park is very open and often mountainous, often providing good views of sunrise and sunset. During the daytime, the sun is painfully bright and its light harsh. Good photographs can be made during that time, but a polarizing filter is necessary, and even then most photographs have a great deal of contrast. Wildlife photography is also a possibility, especially near sources of water, which include campgrounds. The park is one of the most popular rock climbing areas in the world with more than 4,500 established routes offering a wide range of difficulty. Note that there are differing regulations depending on whether a climb is being done within the designated wilderness area or not; check with a ranger for current regulations. Services within the park are limited, but food, gas, and supplies can all be purchased just outside of the park in the City of Twentynine Palms. Park visitor centers all offer bookstores selling postcards, posters, and books of local interest. There are no restaurants or stores in the park, but numerous options are available along Highway 62, north of the park, or in towns such as Twentynine Palms, located to the east and west of the park along Interstate 10. Joshua Tree Village has a variety of cafes and restaurants. There are plenty of vegan and vegetarian options in the Village. Every Saturday, year round, the Village holds a farmers market. Water is available from all visitor centers and a few of the campgrounds, and the Oasis Visitor Center also sells beverages. Towns, such as Twentynine Palms, located outside of the park borders offer additional options for refreshment. There are no hotels within the park, but numerous hotels cluster along Highway 62 in the towns of Twentynine Palms and Joshua Tree . There are many campgrounds within the park, but they will often fill well before sunset, especially on weekends. Sadly, as of 2005 there are no longer any free sites, although costs are reasonable at $5 - $10 per night. All campgrounds are open year-round. Note that some sites may be reserved in advance through the National Park Service Reservation System. Belle Campground. A primitive campground located near the North Entrance Station. 18 sites, $15 per night [2015-Nov], no water available. Black Rock Campground. Located in the northwest corner of the park, this campground is not accessible from the main park roads. 100 sites, $20 per night [2015-Nov] water and flush toilets available. Cottonwood Campground. Located next to the park's south entrance. 62 sites, $20 per night [2015-Nov], water and flush toilets. There are also three group sites available for $25 per night. Hidden Valley Campground. Hidden Valley is the first campground after the West Entrance Station. 45 sites, $15 per night [2015-Nov]. There is no water available and motorhomes and vehicles longer than 25 feet are not permitted. Indian Cove Campground. This campground is not accessible from the main park roads and may be reached only via Highway 62 and Indian Cove Road, between the North and West Entrance Stations. 101 sites, $20 per night [2015-Nov]. Water is available from the ranger station, and thirteen group sites are also available for $20/$35 per night. Note that in winter this is the warmest site, as it's 1000' lower. Jumbo Rocks Campground. The largest campground in the park, located near the junction of the park roads in the northern part of the park. Sites are surrounded by scenic granite formations. 124 sites, $15 per night [2015-Nov], no water available. Ryan Campground. Easily accessible from West Entrance Station, a primitive campground with 31 sites, $15 per night [2015-Nov], no water available. Sheep Pass Group Campground. Groups only, located along the West Entrance Road. Six sites, $20/$35 per night, no water available. White Tank Campground. Located along the main park road, close to the North Entrance Station. 15 sites, $15 per night [2015-Nov]. There is no water available and motorhomes and vehicles longer than 25 feet are not permitted. Permits are required for all backcountry camping and can be obtained at the visitor centers. Backcountry campsites must be located at least one mile from the road and 500 feet from any trail. Camping in washes is not recommended due to possible flash flood danger. All water must be carried in as natural water sources are limited and reserved for the local wildlife population. Open fires are also forbidden, and all cooking should be done over portable camp stoves. The backcountry is not crowded, and backcountry campsites will be isolated. By far, the greatest danger in this park is the weather. Due to the high desert environment, it will be blazing hot during the day and temperatures may drop to freezing during the night. Do not hike without adequate water. One gallon per person per day is the minimum recommended amount. Wear sunscreen, dress in layers, and take all other precautions when dealing with a desert environment. Be aware that even a tiny amount of rain can cause flash flooding; avoid canyons and drainage areas during severe weather. Other dangers within the park include rattlesnakes, abandoned mines, and the numerous prickly and thorny desert plants. In general, snakes can be avoided by being careful when in rocky areas. Mines can be found throughout the park, and while most have been sealed over, open mines can still be found. Do not enter mines - most of these areas are over 100 years old and are extremely dangerous. Twentynine Palms. Located on the park's north border, this town provides a source of lodging, food and supplies for park visitors. Palm Springs. A desert oasis located south of the park, Palm Springs offers resorts, golfing, dining, and other escapes for travelers. This page was last edited on 27 August 2018, at 16:54.